RG1177AP – A lovely villa for sale Rogoznica is located only 50m from the mesmerizing blue sea in a beautiful and serene bay. This is a three-level off-plan property with a pool, a private parking and two spacious terraces with fabulous sea views. The ground floor of the villa is 111m2 and contains an entrance hall, a bedroom, a bathroom, a toilet, a wardrobe, living room, a dining room, a kitchen, 2 storage spaces and a covered terrace of 46m2 with a sundeck and a 30m2 pool. The first floor has a total surface of 69m2 and it consists of an anteroom, 2 bedrooms with their own bathrooms and a terrace of 24m2. The attic of 27m2 has one bedroom. The villa is placed on a 480m2 land plot and it is surrounded with a charming Mediterranean garden. It has great window and wall insulation. A lot of wood was used in the interior (entrance door, window shutters, ceiling beams, and flooring in the bedrooms) which creates a natural and calming feel. The villa for sale Rogoznica can be your excellent second home in a captivating bay with the crystal-clear seas, far from busy roads, but at the same time only 12km to Rogoznica and its superb marina with all the necessary amenities. From this location you are also close to Primosten (19km), Trogir with the airport nearby (27km), Sibenik (46km), as well as Krka National Park (54km). 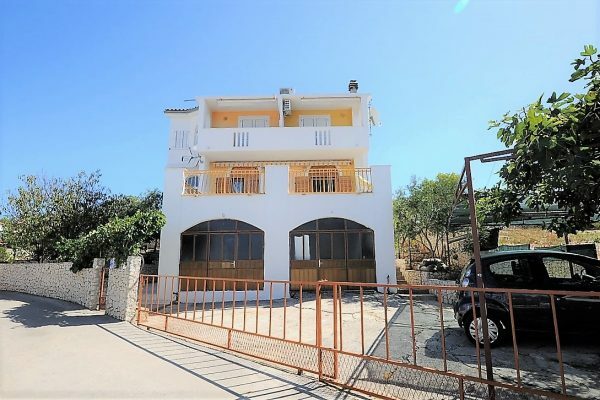 Thanks to its advantages and location, the villa also represents a great business investment, ideal for seasonal renting.